Buses, including school buses, mass transit buses, city buses and private charter buses, cause thousands of injuries and deaths each year in Massachusetts and across the U.S. In Massachusetts, major bus service providers include the MBTA, BAT, WRTA, MVRTA and CCRTA. The MBTA is the largest provider of bus services and serves Boston, Cambridge, Quincy, Watertown, Waltham, Newton and many other communities. Bus accidents may be caused by a number of factors, including distracted driving, cell phone use, operator error, speed, driver fatigue, intoxication and maintenance violations. Like subways and trains, buses are considered common carriers. As such, they are held to a heightened liability standard. If you are injured by the negligence of a bus operator, the company may be liable for your injuries. 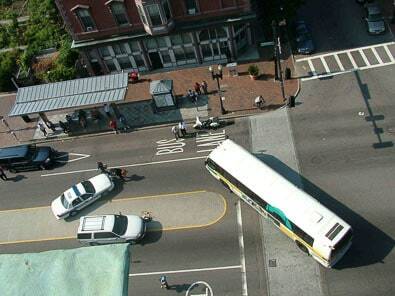 Bus accidents can happen due to operator error, failure to maintain the bus and in some cases, defective design. Bus companies have a duty to ensure drivers are properly trained and know how to properly handle the equipment. Bus companies have a responsibility to make sure their drivers are properly rested and are not fatigued from excessive hours on the road. Further, bus companies have an obligation to properly maintain vehicles and keep maintenance logs. Drivers have a responsibility to keep their attention on the road and follow safety guidelines, even if they get behind schedule. Cell phone use is banned by bus drivers in Massachusetts. This includes talking on cell phones, texting while driving and e-mail. Failure of bus companies and individual drivers to carry out these responsibilities is negligence on behalf of the bus company. When a bus overturns on a highway or collides with another vehicle, it is likely that there will be wrongful death or personal injuries. These injuries may include head trauma, lacerations, broken bones and internal injuries. These injuries may prevent passengers from returning to work for a long period of time. Passengers may also suffer debilitating emotional trauma. Bus and motor coach companies, maintenance companies and design and engineering firms and others may be liable. Bus companies typically have insurance policies which are capable of compensating bus accident victims. First, seek appropriate medical treatment. Then, contact an experienced Massachusetts bus accident attorney who can preserve your rights. All accident cases are governed by the Statute of Limitations, and when municipal carriers are involved, there is likely a shorter period for the required statutory notice. In bus accident cases, it is important to preserve evidence while it is still fresh and to stay informed about what evidence has been gathered by local, state and federal authorities. An experienced bus accident lawyer will promptly contact officials and launch his or her own investigation. The Boston bus accident attorneys at Breakstone, White & Gluck have the experience, expertise and resources to obtain the best results for you. If you have been injured in a bus accident, please call us today for a free consultation. We can be reached at 617-723-7676 or toll free at 800-379-1244 or use our online form.